Riders, made contributions as songwriters and performers with such hits as "Memories Are Made Of This"
Spinners, The Three Lives of Thomasina, and the television program The Wonderful World of Disney. Walt Disney Pictures releases The Straight Story, directed by David Lynch. Liz Smith, appears in papers across the country. The Alice Comedy Alice Plays Cupid, directed by Walt Disney, is released. While serving as a lifeguard, Julius falls in love and then saves the life of a cute female cat. Alice (played by Margie Gay) helps out by driving the car they eventually elope in. Disney's Mickey Mouse cartoon Touchdown Mickey, directed by Wilfred Jackson, is released through United Artists. Comedian/actor Larry Miller is born in Valley Stream, New York. His Disney credits include The Princess Diaries 2: Royal Engagement, Max Keeble's Big Move, The Princess Diaries, Buzz Lightyear of Star Command (as the voice of XR), and the 1995 TV remake of The Computer Wore Tennis Shoes. Miller also appeared in 12 episodes of the ABC-TV sitcom 8 Simple Rules and played Mr. Hollister in Touchstone Pictures' 1990 hit Pretty Woman. himself to be taken from the jungles of Africa and brought to New York City to get a taste of civilization. airs "Chico, the Mismatched Coyote." of Timon in Disney's Timon & Pumbaa television series. 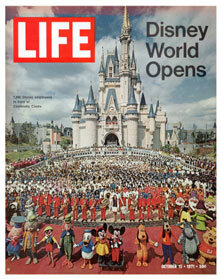 includes a pull-out poster (sponsored by Eastern Airlines) of the new Magic Kingdom. series of rehearsals at Radio City Music Hall with famous conductor Arthur Fiedler. Florida as part of its formal dedication, and at the John F. Kennedy Center in Washington, DC. The Main Street Electrical Parade at Disneyland gives its final performance. In New York City, previews begin for Disney's live Broadway show The Lion King. The Times Square Disney Store, connected to the New Amsterdam Theatre, is filled with Lion King merchandise. Epcot's Innoventions West closes for a major renovation. located at Disney-MGM Studios. The 26-minute performance requires 88 people to dazzle park guests. Disney's Mickey Mouse short Clock Cleaners opens in theaters. Mickey, Donald, and Goofy find themselves high above the city skyline - washing and cleaning an elaborate high clock tower. Hilary Duff's debut album Santa Claus Lane is released on Walt Disney Records. became interested in pursuing a music career after attending a Radio Disney concert! for his work on such early shorts as Three Little Pigs, The Moth and the Flame and The Brave Little Tailor. balconies of lake view rooms! Firehouse Five Plus Two (a Disney employee Dixieland band). appearance of the kitten and goldfish since their debut in the 1940 feature Pinocchio. The Walt Disney Comedy and Magic Revue is released on VHS and Beta. Containing funny and magical moments from various Disney classics, it features archive footage of such stars as Julie Andrews, Eddie Albert, Ken Berry, and Ray Bolger. English actor/singer Gavin Lee, best known for his award-winning role of Bert in both the West End and Broadway productions of Mary Poppins, is born in Woodbridge, Suffolk, England. He was nominated for Best Performance by an Actor in a Musical at the 2005 Olivier Awards and the 2005 Theatregoer's Choice Awards for originating the West End role of Bert. The Mickey Mouse musical cartoon The Jazz Fool is released. Directed by Walt Disney, it is a salute to two recent Al Jolson films, The Jazz Singer and The Singing Fool. "The new site is Florida, but the air is pure old Disney." employees at official Disney World functions for two years. preserve the history of the company. Phineas and Ferb, is born in Rochester, New York. Grade and Recess: All Growed Down. Caudell was also the voice of Tripod for 101 Dalmatians: The Series.